As grass emerges after winter, your lawn may not look quite as perfect as you remember! During cold, snowy winters, lawns take a beating. All that snow, ice and sleet does damage — especially if you live in a colder region where salt is spread to melt ice. And, pets don’t like the cold winter either! Often, they go to the bathroom in the same spot, so they can dash back inside as quickly as possible. Both winter salt and pet urine cause ugly, patchy spots in the lawn. But don’t despair. All your lawn needs to recover is a little help from its friend, Espoma’s Garden Gypsum. 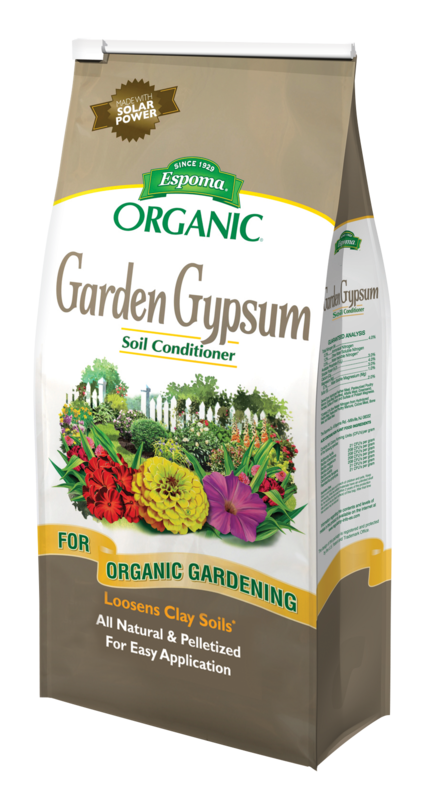 How do you know if gypsum is right for your lawn and garden? If you see unsightly yellow or brown spots in the lawn, that’s a burn spot that gypsum can restore. Take a close look at the grass around walkways, sidewalks, roads and driveways. These areas are most likely where you or your county applied winter salt to melt ice. Salt draws moisture from grass roots causing it to turn brown. Also, check areas where your pets frequently go to the bathroom for damage. Then, transform those ugly brown spots into lush, green lawn by amending the soil with gypsum. Gypsum works to replace the salt, heal the grass and encourage new growth. Add all-natural gypsum now and as needed as lawn burns appear throughout the season. Simply use a drop or broadcast spreader to apply to damage spots in your lawn or garden. No need to work it into the soil. In the garden, add compost to help with drainage problems, too. Finally, lightly water. As the pellets dissolve, your soil improves!